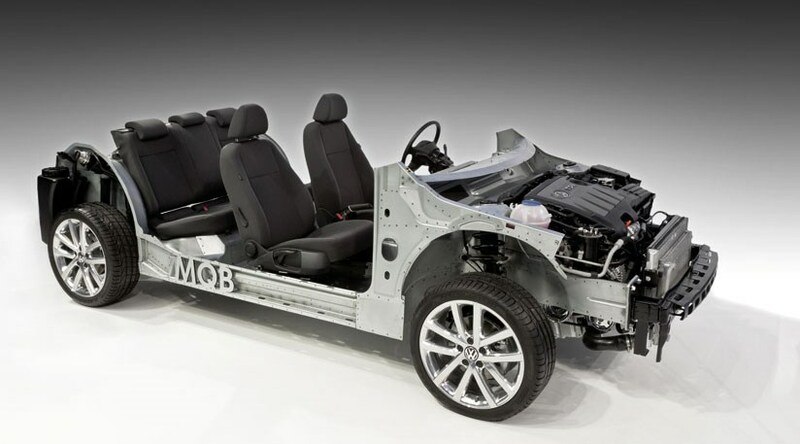 Is VW’s recently announced MQB (Modular Transverse Matrix) a new idea or old hat? Starting with the new VW Golf Mk7 arriving in the UK in spring 2012, the idea heralds a return to basic principles of mass production in an industry where over the last 100 years, complexity has spiralled out of control. By creating a standardised, interchangeable set of parts from which to build a variety of cars, VW plans to cut the time taken to build a car by 30%. Body and chassis are a hybrid of steel and aluminium panels, joined by a new riveting process with a special coating to prevent electrolytic corrosion. On average, cars will weigh 40kg lighter than today’s equivalents, the next Golf tipping the scales at much the same weight as a 1997 Golf Mk4. All engines are designed the same way with the exhaust mounted to the rear and both diesel and petrol are inclined backwards at an angle of 12 degrees, so body shells are completely unaffected by the choice of engine fitted. Even the direct injection, boosted engines themselves are modular in the way they fit together. The new family of EA211 TSI petrol engines are dimensionally very similar but easily configurable to produce different levels of power. No tricks have been missed when it comes to cutting weight here either. The aluminium blocks are 16kg lighter and other major parts have been lightened too, so the 1.4-litre comes in at 22kg lighter than its EA111 predecessor. The new 1.2-litre engines produce 84bhp and 104bhp with 121lb ft and 129lb ft torque. The 1.4-litre gives 120bhp and 138bhp with 148lb ft and 184lb ft torque. Exhaust manifolds are cast as one into the cylinder head so the engines are extremely compact. They get a dedicated cooling circuit and the main engine has two cooling loops, top and bottom, to extract maximum efficiency. There are no fancy, twin-scroll turbochargers; simple, single-scroll compressors do the job - saving weight and cost. Making its debut in the 138bhp, 1.4-litre is ACT (active cylinder management), shutting down cylinders two and three. Two-cylinder mode works between 1300rpm and 4000rpm and when producing between 18lb ft and 74lb ft torque. That equates to steady, constant speed driving and at around 30mph and VW claims a saving of a litre of fuel every 60 miles. According to a senior engineer I spoke to, it’s active for 75% of the time in the EU test cycle. The new Euro 6 EA288 TDIs are just as advanced. At 1.6 and 2.0 litres in capacity, total emissions are reduced by as much as 45% with CO2 alone down 7%. Power output is 89bhp and 187bhp respectively, the engines producing between 184lb ft and 280lb ft torque. Overall, diesel performance is up compared to the previous generation from 12-26% depending on the configuration. MQB-built cars will come with more tangible goodies too and the new Golf will be available with some premium options including camera-based traffic sign detection to help avoid breaking speed limits, fatigue sensing which detects erratic use of the steering wheel, adaptive cruise control, front assist area monitoring and lane keeping. An all-new electronic limited slip differential will be fitted with the most powerful engines. At the Nurburgring 24-hour race, a Scirroco fitted with it lapped 8.5 seconds faster than a sister car without it. All cars will have a new variable ratio electric power steering system, the variability achieved mechanically (through gearing) rather than electronically. Passive safety will be improved through the introduction of a pre-crash protection system into the smaller cars. There will also be a multi-collision brake system which applies the brakes automatically following an impact, preventing cars rolling on into another crash. Inside, a new 8in touch-screen system has a built-in proximity sensor which VW says makes it safer to use when driving. Sensing the imminent arrival of a finger, it switches automatically from display to operating mode. Overall, the plans look impressive and will enable VW to build bigger numbers of cars in the smaller AO to B segments (they plan to build 10 million of the new engines per year by 2020). The new MQB architecture may be part of a grand plan to make sure VW doesn’t go the same way as some others in these troubled times, but customers should get better value for money too.